Book aims to open up Lough Derg to a new generation of pilgrims and rekindle its importance for people who have been many times. A new book on Lough Derg, the oldest continuous pilgrimage in Europe, will be launched this weekend on Station Island by the Bishop of Clogher, Dr Liam Mac Daid. 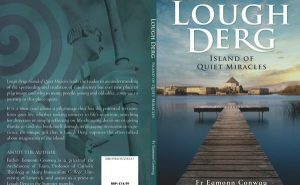 ‘Lough Derg, Island of Quiet Miracles’ brings, according to its publishers, the story of Lough Derg up to date and opens the mystery of the national shrine of St Patrick. Rev Professor Eamonn Conway, a priest of the archdiocese of Tuam and a member of the pastoral team on Lough Derg since 1984, is the author of the new book. Lough Derg Prior, Fr Owen McEneaney, described the book as “timely”. Michael Kelly, Managing Editor of The Irish Catholic Newspaper, which has produced the book, also commented ahead of Saturday’s launch, describing Lough Derg as a powerhouse of spirituality in Ireland. He expressed the hope that the book would open up Lough Derg to a whole new generation of pilgrims while at the same time rekindling the importance of the spiritual heritage of the place for people who have, many times. “The great strength of the book is that it is not an outsider’s perspective, or a preachy book telling pilgrims how they ‘should’ experience Lough Derg, but it is based on Fr Conway’s own experiences on the island over more than 30 years and his journeying with and listening to the varied reasons that bring pilgrims to the island and keep them coming back. “There’s something in Island of Quiet Miracles for everyone, and it explores Lough Derg as a place where great things happen, but often in small ways”. Since the time of the 5th century Lough Derg has been a place of pilgrimage. People have visited this sacred Island for healing, inspiration and guidance. The Three Day Pilgrimage begins on Wednesday 1st June and continues until 15th August 2016. Pilgrims can begin their pilgrimage on any day up to and including 13 August. During the Three Day Pilgrimage, pilgrims make ‘Stations’: they walk barefoot, kneel on the hallowed beds, fast, pray and keep vigil. 14,000 pilgrims visit Lough Derg every season May – September and since the late 1800’s the number is estimated to be over two million. In additional to the Three Day Pilgrimage there are opportunities to come on Day Retreat, Themed Retreat Days and Quiet Days. Some 80% of pilgrims return to the island each year and a growing number of new younger people come to experience the sacred island. Saint Patrick’s Sanctuary – the pilgrimage site – is located on Station Island in Lough Derg which is four miles north of the village of Pettigo, Co Donegal. It is often referred to as Saint Patrick’s Purgatory or simply Lough Derg. The Diocese of Clogher has been the sole custodian of Lough Derg since 1780. Historical records date the practice of pilgrimage here to the 7th century. Legend also presents the cave on the island as the place where St Patrick had his vision of Purgatory. St Patrick is said to have left a disciple in the area and the foundation of one of the earliest monastic Christian settlements followed. The remnants of the monastic prayer cells remain central to the pilgrimage tradition. Today, the Lough Derg Three Day Pilgrimage follows a pattern prayer from the Celtic monastic time and shows remarkable continuity with the earliest systematic account of the pilgrimage, which dates to the 1600s. Before this, several accounts of pilgrimage to Lough Derg survive from medieval times. A 1346 Purgatory fresco on the wall of a convent church in Todi depicts St Patrick, and witnesses the fame of Lough Derg in continental Europe at that period. Following the Celtic monastic period, history points to the Canons Regular of Saint Augustine (12th – 15th Century) and the Franciscans (late 15th Century – mid 18th Century). The Lough Derg pilgrimage continued through the religious persecution of post Reformation times. A detailed account survives in the 1714 Relatio Status of Bishop Hugh MacMahon.